Watching food related television shows may not exactly be your idea of fun. But the truth is that Food Network has a lot of shows that are actually great. While I was doing an article for my blog the other day, I found myself procrastinating with hours of these morsels. For one, they’re not your ordinary old-fashioned instructional cooking shows. (Although I had to admit I loved Mario Batali during his Molto Mario days and he’s the perfect examply for such kind of dude.) Watching these guys do wonders in their cool kitchen makes me want to befriend them so that I can actually hang out in their kitchen while they cook. These awesome TV shows are the kind that brings you in and keep you rapt for an hour without you realizing a minute has passed. Unearth these TV show treasures on the Food Network and forget all your troubles away. Isn’t that what cooking shows are for? The following shows technically (except for the ones that were aired starting in June) hasn’t aired yet, but I’m pretty sure they’re just going to be great. So watch out for these shows! Spend a fun and food-filled morning in The Kitchen with hosts Sunny Anderson, Katie Lee, Jeff Mauro, Marcela Valladolid and Geoffrey Zakarian. These five talented food experts will bring fun conversation and delicious recipes into your kitchen every week. They’ll cover all things fun in food, so pull up a stool at the counter and join us in The Kitchen! 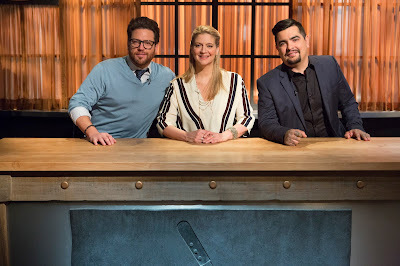 Chopped is a cooking competition show that's all about skill, speed and ingenuity. Join four up-and-coming chefs compete before a panel of three expert judges who take everyday items and turn them into extraordinary three-course-meals. Course by course, the chefs will be ‘chopped’ from the competition until only one winner remains. The challenge? They only have seconds to plan and 30 minutes to cook an amazing course with the basket of mystery ingredients given to them moments before the clock starts ticking! Four baking masters compete and showcase their culinary creations on Food Network’s Cake Wars. Hosted by Jonathan Bennett, the four expert bakers go head to head in a series of heated challenges, creating the most extraordinary cakes in hopes of winning the judges’ hearts! Who will emerge victorious and take home the grand prize of $10,000?